Apple has certainly changed the lifestyle of millions of people. The world is witnessing a digital revolution in the form of new age smart phones, tablets, ultra thin notebooks and thanks to Apple! They are the pioneer in this market and Steve Jobs deserves all accolades. People were so obsessed with the iPhones and iPads. iPad2 had rocked the sales figures and it emerged as a clear winner in the market. iPad 3 has created much sensation among the Apple lovers. They are expected to hit the market by March 2012 considering the launch dates of its previous versions. 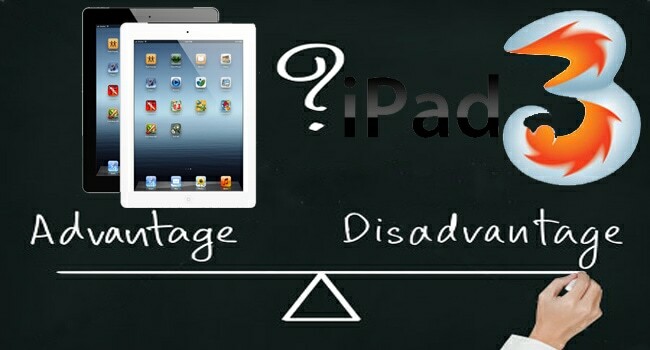 Here is a predicted comparison of iPad3 advantages and disadvantages from a common user’s perspective. iPad3 is expected to come with 2 variants in its screen size. The first variant is of 7 inch screen size and the second one is about 9.7 inch screen size. You will be able to find the best pick that will fit your pocket-size with these variants. High definition viewing will be enabled with its Retina display technology. This technology will support the extended graphics system of QXGA that features 2048×1536 pixels with 4:3 aspect ratio. The disadvantage factor with this feature is that it is already available in its iPhone version. There will not be any sort of difference using an iPad3 and an iPhone 4S. iPad3 is expected to powered by A5 dual core processor which does not offer any extra functionalities and features when compared with its predecessor A5 processor in iPad2. It is going to be a big disappointment for the end users. The presence of SD card slot is good news and cheering. It will allow the end users to transfer heavy files easily and in a faster manner. This provision was not available with iPad2. Features similar to this are creating a sensation in the market. Using Thunderbolt port should create ripple of waves and anticipation in the market. This enables high-speed connectivity and supports data transfer rate up to 10Gbps. You can enjoy the high-definition movies better in a larger screen as Apple is expected to have this feature in its Mac laptops. iPad3 is expected to have 8 MP camera which should be an additional advantage. iPad2 had VGA capable front camera. However, experts argue that 8 MP camera is not up to the expectation for the much hyped tablet. iPad3 supports Near Field Technology that allows the mobile phone users to pay to the retailers while on the go by waving the handset across the readers. It is good news that people can do shopping with the help of their tablets too. Last but not the least, the battery is expected to be slimmer to deliver high performance. However, the battery is going to be available at a price of 20 to 30% higher than its iPad2 variant. People are in no mood to accept the disadvantages of Apple products because of its brand value. The brand name stands high and lives up to the expectations of the fan frenzy crowd. This is a guest post by Rajkumar Jonnala. He is a part time blogger and in his free time he writes a lot about technology at Picsplz. Follow him on Twitter and on Google+. Wow…next year’s going to be a big year for the Apple, I guess. Launching a new version without Jobs, this would test all of their’s skills. Im sure that ipad3 would be the best tablet , but there is a little mistake , why tablets does not support USB port?????????? I am a big fan of Apple products and Steve Jobs, he is my inspiration.. Right now am using only Apple iPod, everything will have its advantages and disadvantages, if it is your need you will buy..
Steve Jobs did the same thing, he made products which customers will like…if they like they will take out money from there pockets and buy..
will look forward to buy Apple products in future..
Nice pal. iPad 3 will be a hit but I really like it. Excellent informative write up. I own an iPad 3. It’s awesome tab. Slightly costly but really a good one. But I face the same heating issue frequently. By the way, it’s a nice looking blog. Thank you very much. Wow, is a good advantage of apple vesions i am very like to use iPad3.